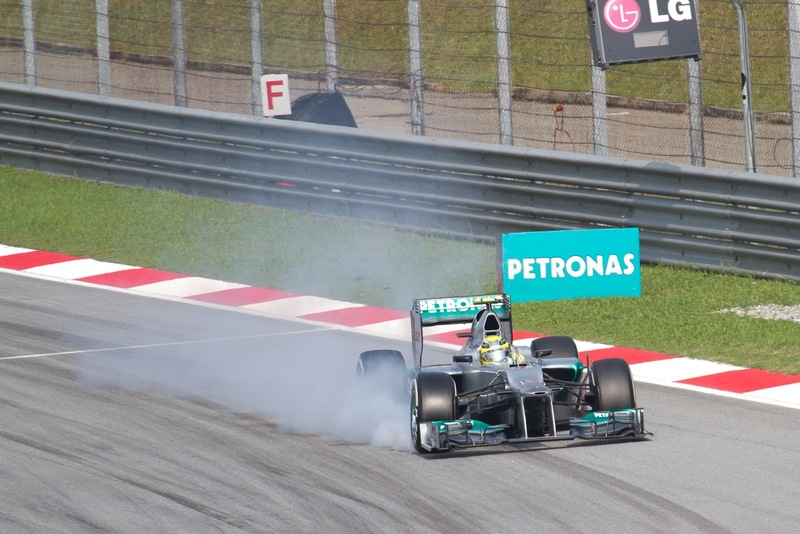 Talking about F1: The F1 blog: Hamilton to flee the nest? 'Silly season' hasn't really been living up to its name in recent times. That the likes of Red Bull, Ferrari, McLaren and Mercedes haven't changed their driving line-ups in the past three seasons has ensured this. And for much of this summer it's looked not beyond the realms that all of those teams would have a fourth straight year with pilots unchanged. But silly season has had the last word: one heck of an F1 story has been sprung on us. One that almost none of us saw coming. Eddie Jordan on Wednesday commented that 'I believe Hamilton and Mercedes have already agreed personal terms and a deal (for Lewis to drive there next year) could be imminent'. A heck of a story as I said. Lewis Hamilton - waving goodbye to McLaren? So, how much traction does this idea have? That the rumour’s come from Eddie Jordan has led to some dismissing it out of hand. But for all of Eddie’s capacity for buffoonery I wouldn’t have thought that he’s just pulled this idea out of the air. Plus, Eddie's close to Bernie Ecclestone and it's been known for Bernie, who tends to know more than most, to use EJ as a vehicle to get stories out there. Also, conspicuously, no one's denying anything (not Lewis, nor his management, nor Mercedes). And as if by magic in the last 24 hours or so since the story first broke we've had subsequent stories that give the Lewis to Mercedes idea additional credence, such as more positive noises on Merc's long-term commitment as an F1 constructor, as well as talk of Michael Schumacher being offered a team role at Mercedes once he stops driving (and thus creates a space in the driver line up). Of course, there are the usual disclaimers: in F1 there’s always the possibility of double-motives, for example someone in the Hamilton camp might have put this rumour around to try to cajole McLaren into giving Lewis more favourable terms in his new contract, or something similar. There may also be nothing to see here. Unlike in football say, dialogue between drivers/their representatives and other teams is pretty much an ongoing process in F1, and with Lewis Hamilton's contract up at the end of the year it makes absolute sense for his management to have been in discussions with Mercedes as well as with McLaren. If nothing else it strengthens Lewis's bargaining position. Though EJ did go a little beyond this to say that Lewis signing for Mercedes 'could be imminent'. It's very clear what would be in this for Mercedes. Lewis would represent a clear step up in quality from its current drivers, being as he is almost certainly one of the top two drivers in the sport right now. And this year he's been at his absolute best. And while the Mercedes team would have to clear a space in its driving line up for him, and if it was Michael Schumacher who is to make way it would need to appear that Schumi was leaving willingly otherwise the German marque will lose a lot of face, in F1 there's always a way. But it's less obvious at the topline level what would be in the move for Lewis. Mercedes team principal Ross Brawn does have an exceptional record in the sport as well as a lot of ambition for the team. And while this year's Mercedes has for the most part been off the pace, Brawn's made a lot of changes and brought a lot of new people into the team recently which probably won’t have had an impact on this year’s machine, so it could be that the 2013 Merc flies. And as Brawn pointed out conveniently today, come 2014 when the new engine regulations come into force being at a manufacturer team will likely be a big advantage; Adrian Newey has predicted that F1 in 2014 will in effect be an engine formula (it's speculated that the Vettel/Ferrari for 2014 rumour is based on something similar). So Lewis might be playing the long game. And it's tempting to assume that Brawn plus cash will get it right eventually. But even so, going to Mercedes would be one heck of a risk for Hamilton. Most acutely in this is that the Brackley squad under its various guises, aside from in 2009, has persistently and often spectacularly failed to get it right for over a decade. And as the likes of Honda and Toyota might tell you in F1 having a bottomless budget doesn’t necessarily guarantee success. By contrast, McLaren is one of the few teams in F1 that you can be confident will be in the sharp end mix almost every season. And McLaren presumably will fight hard to keep him - no other driver available is even close to Hamilton on ability. But while there are plenty of reasons to think that Lewis to Mercedes sounds implausible, it's one of those delicious ideas that the more you dig down the more you discover reasons to think that it just could have some life in it. For starters, Lewis hasn’t been in a hurry to sign a new McLaren contract and that driver/team relationship has on occasion shown outward strain. Plus it would be reasonable if Lewis sees one drivers' championship in five (possibly six) seasons at Woking as poor return, and let's not forget that the McLaren team has won the constructors' title only once in the last 20 years. So there are some reasons to think Lewis could be minded to move on. And if he does move on Mercedes is probably his best bet of what’s available: there are no seats free at Red Bull for next year and Fernando Alonso has presumably vetoed a Ferrari move. And Mercedes, unlike McLaren, can probably pay Lewis whatever he wants, as well as give him much more freedom to earn from personal deals than is the norm in the Woking way of doing things. But it's the bigger picture that gives the Lewis to Mercedes move most credence in my view. Lewis likely sees this career choice facing him now as a pivotal one. At 27 he's approaching the sort of age where he'll be at his driving peak and will win the bulk of his races and championships. And 14 years on from joining the McLaren team the 'time for a change' feeling may become overwhelming; indeed the suspicion may linger somewhere at the back of his mind that if he doesn't leave McLaren now he might never leave. And perhaps most pertinently, Lewis is a now a global superstar at the peak of his sport, far removed from the 13 year old youth that joined the McLaren outfit all those years ago. He may well now view himself as the kid who grew up, that's now ready to flee the nest and prove himself 'on his own' as it were. And like a lot of parents, even after growing up McLaren may struggle to see him as anything other than the kid it nurtured, no doubt much to Lewis's chagrin. McLaren has also in the past been known for being a team more to the 'stern parent' end of the scale in how it manages drivers. This was thought to be a factor in both Kimi Raikkonen and Fernando Alonso leaving the team in recent years. 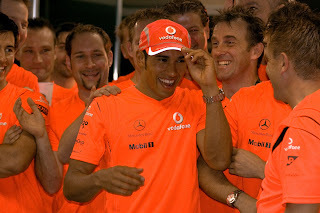 Also, just a thought, it's the case that McLaren has a bit of a previous when it comes to falling out with its star drivers: Prost, Lauda, Alonso, Raikkonen, Montoya….all left the team under a cloud having fallen out with the management, and the list reads a little like a who's who of modern F1. Will Lewis be just the latest on the list? And just as Michael Schumacher was in deciding to join Ferrari for 1996 rather than the likes of Williams, Lewis may well be tempted by the sporting challenge of building up a team with a famous name, which has been in relative doldrums but also has bags of potential. Rumours in F1 have a tendency to develop a life of their own, and the Bernies of this world aren't above 'yanking our chain'. So it could be that we're all getting terribly excited over not very much. But the reason this Lewis to Mercedes rumour is so wonderful is that while there are plenty of reasons to think it's a nonsense, there are also a good number of reasons to think it might happen. Hamilton and Mclaren have just one choice; to stay as they are. For Lewis, it is a huge mistake to move to an underperforming team and for Mclaren it is a mistake to lose one of the 'big three'.